Eartha Kitt was born to share croppers in South Carolina. She was sent to live with her aunt in Harlem, at age seven. Her career began in the late forties as a cabaret singer, & actress. She had a string of minor hits in the 1950's and a disco hit in 1984 called "Where is My Man". Her most famous song is the sultry Christmas classic "Santa Baby" . Kitt appeared in many films with the stars like Orson Welles & Sidney Poitier. In 1968 at a White House luncheon she spoke out against the Vietnam war and made Lady Bird Johnson cry. She was blacklisted in the entertainment industry in America. She went over seas and had a successful theater career around the world. She returned to Broadway in 1978 in the hit "Timbuktu!" She remained active through the eighties & nineties (like Eddie Murphy's movie Boomerang), & in the 2000s she still performed on Broadway & as a cabaret singer. She passed away on Christmas Day at age 81 from colon cancer. As a huge fan of the Batman TV series, lets remember her as Cat woman #3. 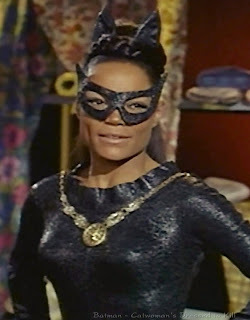 In Batman's third TV season, Julie Newmar was filming a movie and the role of Cat Woman went to Eartha Kitt. Kitt appeared in three episodes during that final season. Most famous for rolling her R's during dialogue she added her special touch for cat woman, a "Purrrrrrfect" role for her. Episode #108- Cat Womans Dressed To Kill (aired 12/14/67)- Cat Woman is jealous she is not voted one of top 10 Best Dressed Women in Gotham City. She sets off a hir raising bomb, and steals one of a kind dresses. She kidnaps Batgirl in a woman's dressing room. At her hide out she ties up Batgirl on a table & lines up an electric saw to split her in half, she is rescued by Alfred disguised as the Worlds Oldest Hippie. Cat Womans hideout is located on 32 Pussyfoot Rd. Episode 110-Funny Feline Felonies & 111- The Jokes on Cat woman: These episodes were aired thirty nine ago this week (12/28/67 & 1/4/68). Cat woman in her Kitty mobile picks up the Joker upon his release from prison. They intend to blow a hole in the Federal Depository and clean the $$ out. The dynamic duo & Batgirl are on their trail. They capture Batgirl and tie her up on a front lawn with Deadly Cat Whiskers, that will expand with body heat & strangle her. Batgirl escapes by turning on the sprinklers, releasing the wet whiskers. 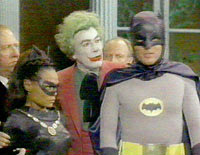 Batman captures the villain's at Phony Island gathering gunpowder and a trial is set with Lucky Pierre representing the villains. A fixed jury of criminals is foiled and the fiends go to jail. **Eartha also was the voice for the original television ads for the new Steely Dan album "Aja" back in 1977. I can remember me & my brother mimicking that commercial like it was yesterday.